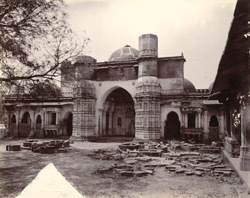 Photograph of Dada Harir's Mosque at Ahmadabad in Gujarat, taken by Henry Cousens in the 1880s, from the Archaeological Survey of India. The mosque and tomb of Dada Harir were constructed either for or by Bai Sri Harira in 1501, a lady belonging to the court of Sultan Mahmud Begarha (r.1458-1511), who was known for developing parts of Asvara in the 16th century. The architectural structure of the mosque is a simplified version of the Bibi Achut Kuki mosque also at Ahamadabad. There are five domes, each with a corresponding mihrab on the west wall. The central entranceway is flanked by two minarets, octagonal shaped and simply decorated. The minarets of this mosque were damaged in the earthquake of 1819. Later the south minaret was levelled to that of the roof, and the north minaret to the first storey, by the Public Works Department in 1875 as they were believed to be unsafe. The lower portions of the minarets are elaborately carved.